LIC Jeevan Surabhi -106, 107, 108 -All details with premium, Insurance Coverage, and Maturity benefit Calculators. Jeevan Surabhi is a popular money back plan from LIC of India. This plan is offered in three versions with 15-year, 20-Year, and 25-Year terms and corresponding premium paying terms of 12, 15 and 18 Years. Jeevan Surabhi is a withdrawn plan and is no more available for sale. Here at InsuranceFunda, we are getting a lot of queries regarding the benefits of the plan. Let us have a detailed review of the plan. Calculators provided in this post will help you to understand the benefits of the plan better. Increasing risk coverage -What does it mean? Jeevan Surabhi – Latest bonus rates. Jeevan Surabhi – Premium and Benefits calculator. Limited premium money back plans where the entire Sum Assured is paid as Survival Benefits and is called as money back amount. Entire Sum Assured/Money Back is paid within the premium paying term. Bonus and Final Addition Bonus (If any) shall be paid as the maturity amount and is paid at the end of the term of the policy. Loan available after the payment of three full-year premia and completion of three years. Jeevan Surabhi is having inbuilt special provision to increase the death sum assured by 50% in every five years. This provision is helpful in getting an increased death coverage at a higher age without any increase in premium. Simple Reversionary Bonus – Declared every year and added to the policy as and when it is declared. Final Addition Bonus – One-time bonus, declared at the year of exit of the policy which shall be paid at the time of exit by way of maturity or death. LIC declares bonus rates for all its plans every year. Read all the details of bonus rates declared for the financial year 2018-19. Jeevan Surabhi – online calculator is intended to help you in understanding all the benefits of the plan by applying your own details. You can customize the presentations by selecting the term of the plan and proving age and required sum assured. An option is provided to apply rider benefits such as double accident benefit also. If you are unable to view the calculator here, Click here to open the non-amp version of this post. 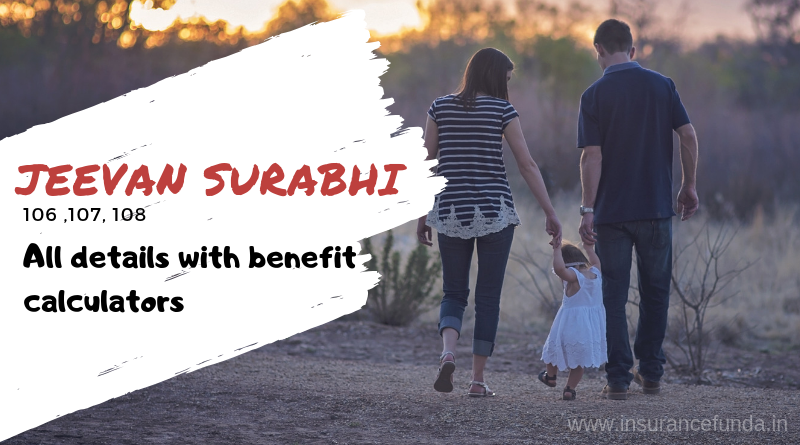 Let us have a look at the variation of premium with the increase in age for Jeevan Surabhi plan. In order to understand the plan better let us consider a sample illustration of the plan. The details considered for the plan is as given in the table below. You can understand the premium, normal and Accidental Insurance coverage, Survival benefits, expected maturity benefits as per the current bonus rates etc. are provided in this sample benefit illustration. You can download the sample benefit illustration for Jeevan Surabhi plans 106,107 and 108 from the links provided below. Download Jeevan Surabhi 25 Year sample benefit illustration.